The Southern emerged from the Railway Grouping of 1923 that also gave us the LNER and LMS and preserved the GWR. It was the smallest of the four, and its key routes linked London with the south coast, from Dover in the east to Plymouth in the west – but the key focus was the south east counties of Kent, Surrey and Sussex. This was an area ideal for electrification and multiple units, and the Southern completed what its predecessors had started with third rail electrification spreading steadily through the 1920s and 1930s. But steam traction was still the best bet for some things – the heavy boat trains from London Victoria to Dover, and the long distance trains to Hampshire, Devon and Cornwall in the south west, where electrification was not yet economic. For these routes, the Southern had the 16 Lord Nelson class 4-6-0s, and the more numerous but less powerful King Arthur class. By the mid-1930s, both were underpowered for the work they were assigned, and the Southern needed to move on. He soon persuaded the Southern’s Board of the need to move on from Lord Nelson, and developed something very different – 21C1 Channel Packet, the first Merchant Navy class Pacific. Other British streamlined engines like Mallard and Coronation were conventional underneath the casing – but Channel Packet was decidedly not. First, the wheels. Rather than the usual steel spokes, Bulleid used a wheel of his design, made from one piece of steel by the great Sheffield steel company Firth Brown. It has indentations in the disc to give strength, and holes to reduce weight. It is 10% lighter than a conventional wheel, and has a more even weight distribution, meaning less damage to the track. Next, valve gear. Instead of the normal Walschaerts gear used virtually everywhere else in Britain, Bulleid used a chain drive gear of his own design for Channel Packet’s three cylinders. It aimed to be light and compact, and drew on motor engine practice. The gearing was enclosed in a 40 gallon oil bath, to avoid the need for daily oiling of the gear. The aim was for the gear to run for 100,000 miles before needing maintenance. Third, the boiler. Riveted boilers had been good enough for everyone else from Stephenson to Stanier, but Bulleid used the first welded boiler in Britain, and it was a success. Finally, the looks. The Southern was not a fast railway, and didn’t need streamliners, but Bulleid clearly wanted to catch up with the rest. His casing was perhaps more modern looking than Gresley’s or Stanier’s – there’s no attempt to follow the shape of the boiler, and the smokebox is accessible in the normal way – and the profile matched Bulleid’s new coaching stock. Bulleid always referred to it as air smoothed, rather than streamlined, and there is some evidence it was intended to allow the engines to pass through automated carriage washers. But some called them Spam cans, after the American delicacy Britain began to enjoy in wartime. And did I mention the bright malachite green livery with sunshine yellow lettering? Even the numbering was different, following the French practice that incorporates the wheel arrangement in Continental style notation. On top of all that, there was a war on by the time 21C1 emerged from the Sothern’s Eastleigh works, in June 1941, making innovative streamlined express engines a luxury. Bulleid got round that by making the driving wheels just 6ft 2 in and calling it a mixed traffic design. As built, the Merchant Navies were almost 70 ft long plus the tender, and weighed 150 tons with the tender. The three cylinders were 18 inches by 24, and the boiler pressure 250 psi. Nominal tractive effort was 37,515 lbf, greater than the LNER A4s but less than Stanier’s Duchesses. The relatively small driving wheels constrained the class’s capacity for high speed, however. Overall, you get the impression that Bulleid had spent 30 years watching others design locomotives, and was bursting to try all his ideas out at once. Some worked – the boiler in particular and details like electric lights and steam operated firebox door, and the cab was widely praised for its layout. But others were more problematic. The valve gear failed to live up to expectations of long life and low maintenance, and the streamlined casing had to be quickly altered to allow steam to rise clear of the boiler and not obscure the driver’s vision. An initial batch of ten Merchant Navies was completed by 1942, all named after British and Empire shipping lines, with elaborate nameplates incorporating the lines’ crests. A second ten were built in 1945, and a third batch in 1948-49. The livery changed from malachite green to plan black, however. Bulleid was proud of his Pacifics, and resolutely defended the unusual features of the design from his critics. And in May 1945, as the war ended, he doubled down with the first of the West Country class, which were named after cities and towns served by the Southern in Somerset, Devon and Cornwall. These were a lighter weight and less powerful version of the same idea as the Merchant Navies, with a smaller, lighter boiler and power output of 31,000 lbf, but to most people looked identical. The design was also the replacement for outdated motive power on non-electrified lines in south east England, and in January 1947, a new batch appeared, named after RAF planes, squadrons, bases and personalities involved in the Battle of Britain – then very fresh in the memory and obviously relevant to the south east. Just to confuse us, the Southern spoke of the West Country and Battle of Britain classes as separate, but they are identical and were numbered in the same series. The lighter weight Pacifics eventually totalled 110, 66 West Country and 44 Battle of Britain. The last was built by British Railways in January 1951, at the Brighton works of the old London Brighton and South Coast Railway. Others were built at the Eastleigh works, inherited from the London and South Western Railway. And then there was the DD double deck electric unit, which lasted 30 years despite being cramped and poorly ventilated, and thus unpopular with passengers. They were the only double deck stock on Britain’s railways, constrained by the relatively limited loading gauge. By the mid-1950s, the defects in the design of Bulleid Pacifics were becoming more apparent and problematic, and also more expensive and difficult to fix. In particular, the valve gear did not match conventional designs for longevity or reliability, with the chains proving insufficiently precise for the work they were required to do and the oil bath corroding and leaking. BR therefore commenced a rebuilding programme, starting with 35018 British India Line (the Continental numbering had been discarded at nationalisation). Rebuilding produced a very handsome locomotive. Gone was the air smoothed casing, replaced by conventional boiler lagging, and the valve gear was replaced by three sets of typically British Walschaerts gear. The reliability issues were banished, and BR produced to rebuild all 30 Merchant Navies by 1960. A similar programme commenced on the West Country and Battle of Britain class in 1957, and eventually 60 out of 110 were rebuilt before the march of electrification and dieselisation brought the programme to an end. This was the way to cross the Channel in the 1950s, with the coaches crossing the Channel on a dedicated ferry, unless you preferred its overnight companion service the Night Ferry. The engines assigned to the Golden Arrow always got preferential treatment, to suit the Golden Arrows that were affixed to each side and the smokebox. Heading west from London Waterloo was the Atlantic Coast Express, leaving daily with a train that ran through to Exeter and Plymouth, with through coaches connecting to the Southern’s branches in Devon and Cornwall. Although not the equal of the Cornish Riviera on the rival Great Western, it was a fine train, and inspiration for this classic poster. One other train deserves a mention – Sir Winston Churchill’s funeral train, which took the great man to his final resting place near the family home in Oxfordshire after his state funeral at St Paul’s Cathedral in London. The train ran from Waterloo, rather than the more logical Paddington, allegedly because Churchill insisted that President de Gaulle be required to pass through the station named for Britain’s victory over Napoleon 150 years earlier. The engine was the specially overhauled and repainted 34051 Winston Churchill (the engine predated the knighthood) of the Battle of Britain class. The engine is now in the national collection at the NRM, presented with the Southern Railway luggage van used to carry the coffin in a train of Pullman cars, and still bearing headcode discs in a unique ‘V for Victory’ layout. Bulleid didn’t stop innovating and experimenting after the war. In 1949, after three years of development, the Southern unveiled his Leader prototype. This was a steam engine, using the boiler of the Merchant Navy class, wrapped in a steel body with driving cabs at both ends, a fireman’s position in the centre and riding on two six wheel bogies like a contemporary diesel engine. Each bogie had three cylinders, with valve gear in an oil bath and Bulleid / Firth Brown wheels 5 ft 1 inch in diameter. Leader was a failure. Coal and water consumption was excessive, the working conditions for the crew (especially in the cab near the smokebox and the fireman’s central cab) were unbearably hot and the engine was too heavy. On a good day, performance showed promise, particularly in generating steam, but it was clearly not the solution. Only one of a planned five was completed, and by 1951 it had been withdrawn and all traces of all five were scrapped. Bulleid left BR in 1949 – the new nationalised system was not his style – and he moved to join the Irish Republic’s railway system, then known as Córas Iompair Éireann (CIE), leaving his beloved Pacifics behind. But Bulleid did take the Leader idea with him. In 1957, Inchicore Works in Dublin completed CC1 (that continental numbering again). This was a repeat of the Leader idea, but burning peat not coal – Ireland has no coal, but peat is plentiful. CC1 followed several years of testing and development of the peat burning concept, using converted coal fired engines, in conjunction with the government’s Bord na Mona, or Turf Development Board. CC1 used mechanical stokers to feed the turf to the firebox, which was centrally located on a double ended boiler (an idea we have seen before), and chain driven valves appeared again. But testing proved inconclusive, with heavy water consumption and issues around having to keep, in effect, two engines (one on each bogie) in sync. When Bulleid retired to Devon in 1958, the project lost its driving force and was abandoned, and the Republic went to EMD for diesels. By 1967, the Bulleid Pacifics had all gone from the mainline. Many ended at the famous Woodham Brothers scrapyard at Barry, near Cardiff, which became the source of many of the preserved steam locomotives that now operate on the mainline and preserved branch lines across Britain. Today, there are plenty of Bulleid Pacifics about. 10 of the Merchant Navies have been preserved, all in rebuilt form, and some regularly grace the mainlines. Over 20 West Country and Battle of Britain versions are also preserved. The NRM in York has two. 34051 we have already seen, and is in original condition. Merchant Navy 35029 Ellerman Lines isn’t just rebuilt – she’s also cross-sectioned, to show people of all ages how a steam locomotive works – a simply brilliant and fascinating thing to see. To my mind, that makes Ellerman Lines the most important of Bulleid Pacifics, for education is surely the greatest thing any of us can do, and she’s been doing it in the NRM since 1975. The side view of these engines look fine, but the front end needed work – an unfinished design to me. I’m certain the hollow front sure acted as a great smoke lifter, though. I have never found an answer as to why the British loading gauge was so small, since the track standard is common. Makes their trains look like narrow-gauge, rather than standard-gauge. I’m also surprised British/European railways never adopted U.S.-style couplers and abandoned those silly buffers and what it takes to hook up cars by requiring someone to stand between cars. Sorry, they look like toys to me. In the early trains were smaller so the clearances they needed were a lot smaller. Re the loading gauge – that results from being early adopters (we did invent railways after all), and then by the time it became an issue, the impossibility of doing anything about it. Regarding automatic couplings, the UIC (Union Internationale de Chemin de fer) were trying to establish a standard, pan-European automatic coupling at least as far back as the early 1960s (I suspect further). These were to incorporate automatic coupling and uncoupling of the brake lines too. At the time there was still a mix of vacuum and air brakes in regular use across the continent so it was something of a long-term ambition. So far they have singularly failed to herd all the cats to one design, though almost all new stock built since the mid-1960s has been suitable for fitting centre couplings. Very interesting read.I had a picture of the Golden Arrow in a railway book when I was a child, and I always thought it looked a bit alien. I don’t understand the coaches of the boat train crossing the channel if the French railways were different gauge. These days the Irish Rail train to Dublin is a Hyundai…..
Russia is broad gauge – allegedly, to stop the Germans running troop trains direct from Germany to Russia. And in Spain, altho the historic lines are braod gauge (5ft 6in), the new high speed lines are standard gauge, so allowing the French TGV technololgy to be used and for driect trains from Paris to Barcalona. There is also some rolling stock which can adjust froom French to Spanish gauge on the move, which I’d love to see. The track gauge is the same but the loading gauge is different, so as long as the coaches are to the smaller British loading gauge they wouldn’t have a problem. The old Night Ferry coaches used to cross with the passengers in their bunks so the journey was (hopefully) seamless for them from London to Paris. The new High Speed Lines linking to the Channel Tunnel are to the Continental loading gauge, though the original Eurostar trains were designed to the British loading gauge because the High Speed line through Kent wasn’t completed until 2003, even then only to Waterloo. At Port aux Basques in Newfoundland the tracks inset in the paving have both gauges, standard from the mainland were run through a shed where the trucks were swapped for narrow and vice-versa. On the move without stopping sounds like a recipe for trouble. Another great chapter of British railroading, and one that I was quite unfamiliar with. These are lovely locomotives. But Bulleid’s attempts at re-inventing the steam engine with that Leader class was certainly quite the dead end. It seems rather obvious, given its limitations and inherent deficiencies, but he wasn’t the only one who hoped to write a new chapter in steam locomotion. Thank you Big Paws. I grew up too late to see much steam, and when I did run trains it was with diesels. The operational side doesn’t change much, but interested to note that your drivers sit on the left. No matter where they work engineers can’t run trains on the same side they drive a car. It reads like Bulleid needed someone to call him out, not an untypical need with any visionary. The issue with the fireman working in the center and the engineer being hot near the smokebox seems so elementary that it should have obviated construction of those engines. Far as what equipment you use, I love diversity. If I’d stayed with the railroad, my ideal job would have been visiting other countries to learn how they do things. Even on the same division there are many variations of practice between terminals, and those variations are instructive. I learned early on to never ask why a certain terminal does something a certain way; it becomes obvious after working a few shifts there. An early Christmas present! Thanks, Big Paws. I first read about these in a railway phase when I would have been about 12, occasionally I tried to revisit the subject but found it too obscure, to the point I thought I must have imagined it. My memory had conflated the Leaders and the experiments in Ireland. I love this internet! This article was an insight into the distant past when, if a concept could be imagined, it could be realised. The Victorian engineers really changed the world with their visions and this progress seems the last gasp of that mindset. I understand everything’s so much more efficient now, but it’s way less entertaining. Love that double deck passenger carriage, despite its failings. Looks like contemporary Japanese domestic architecture in its “bed of eels” planning. Another great article, though at first when I saw “Southern Railway” I thought of the American version! These late steam engines are quite fascinating for the technical advances still being made in what was clearly a declining technology, and are therefore some of the most interesting ones out there. If I ever visit the UK I definitely want to make it to the NRM, in no small part to see that cutaway! 2 thoughts immediately come to mind, for me. One is about Bulleid and his attitude to existing and previous designs. It seems he felt he could do better by being different, through an apparent application of innovation and experience. Maybe, we could see the Bulleid Merchant Navy Class as the McLaren MP4-12C to Gresley’s Ferrari 458? Sort of? Same issues, similar on the face of it but quite different in many of the solutions used. And from an industrial point of view, why did all the railway companies keep producing their own specific designs in small qtys? To the LNER, the Southern wasn’t a competitor, so why not sell them some A3 Pacifics? Or VW Beetle and everything else? There was some logic in everything different about the Merchant Navies; only the valve gear was a total failure, and can be defended as experimental. And basically, they weren’t allowed to (I think), they all had huge works to keep busy and they never had done, so why start? – inheritance: the Brunel billiard table, or a combination of badly assembled pieces? The Isle of Wight system was made up of about five different companies, mostly poorly financed, all with different aims and design imperatives. Translate that to the mainland… The loading gauge on the Hastings Line is tighter than anywhere else on the system. Needed special trains then, still needs them now. – Bespoke design. Locomotives were built by hand, and each had its own idiosyncrasies. They were often built to reflect the specific requirements of the depot at which they were based. – Coal quality. Engines ran on locally mined coal (I assume Southern was Kentish) which had a host of different quantities and properties. Not forgetting “because we’ve always done it this way”, of course! There were a few examples of co-operation in design terms between the Big Four, for example the loan of LMS Royal Scot drawings to North British for the Southern’s Lord Nelsons, but the only standing formal arrangement was between the LNER and LMS for wagon design and even then it was only some specific types. Go back to the 1860s and 1870s then a lot more of the smaller of the then many railway companies used to buy ‘off-the-shelf’ designs from companies like Beyer Peacock and Sharp Stewart, but as each of the Big Four incorporated at least one, usually more, of the larger Pre-Grouping companies they would have their own works and designs. Sometimes they did still order from the outside builders like North British Locomotive and Robert Stephensons & Hawthorns but they were usually to existing Big Four designs. Good article but the US was running locomotives that were larger and more powerful 35 years before these were built. The wartime locomotives that the US shipped to England and later Europe during WW2 were of a design American railroads had abandoned 40 years earlier but were built because that was all their railroads could handle. The US was running locomotives 8 to10 times the weight of these Pacifics and was using some in the same way, fast passenger service. It was not possible to build locomotives to the size of American ones because of loading gauge restrictions. Britain’s railways are littered with tunnels and overbridges that restrict the maximum height and width. Additionally because of raised platforms* width at cylinder height is even more restricted. 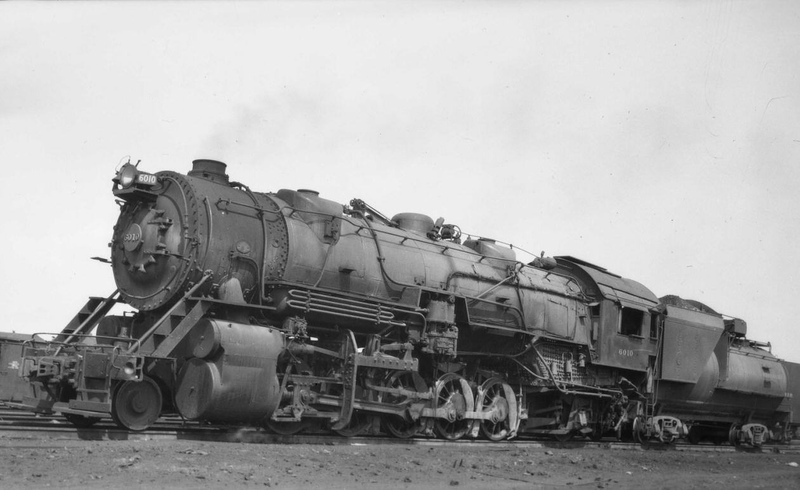 The USATC S160 2-8-0s were specifically designed to fit the British loading gauge though their intended use was after the invasion on the Continent where they would have no problems size-wise. Even so there were still many lines in Britain where they were too large to run. The Southern Railway’s lines in Kent and Sussex in particular had many lines where smaller than standard loading gauges prevailed. Only 6 of the USATC locos were allocated to the SR.
* raised platforms were made a requirement by the Board of Trade who regulated the railways in Britain. They also make it quicker to get on and off trains, more important where stations may only be a couple of miles apart rather than 100s of miles. I’ll probably get flamed (don’t care) but I just don’t see the lure of British (and for that matter European) railroading. Their steam locos are just too “pretty” and delicate for my tastes. I like my steam big, loud, and mean… give me, say, a B&O “Big Six” any time over these toys. You’re not going to get flamed. But railroading, like cars, isn’t just about size and power. Which explains why so many folks have been into European cars for so many decades. Same basic idea. Different circumstances mean different solutions. There are plenty of elegant steam locos I like, for example the mighty New York Central’s Hudsons, especially the early J1 class . A crossbred steam loco/race horse if there ever was one. Always enjoy your superb train posts – enjoyable and informative.